Big thanks to kenneyho for this. Poured into a snifter. 3.5 A: Pours a seemingly viscous black. Two fingers of creamy/frothy light brown head with average retention and a reasonably sized ring of lacing. 4.5 S: This is the type of imperial stout nose that I live for. Harmonious mixture of sweet and roasty with each component working together with the whole. Milk chocolate with an almost lactose-like vibe. The chocolate flavors mend well with coffee flavors forming something like a cold cafe mocha. I can't really pick the honey out by itself, but I think it's meshing with the others flavors. A big roastiness ties all the flavors together. Robust and elegant this is. 3.5: T: I see where the honey is now. It's all in the taste! Anyway, unlike what the nose suggests, the taste is a bit sweeter than I'd prefer or perhaps just not roasty enough. Lots of caramel malt in this gives a caramel and toffee flavor that stands tall. Raisin, figs, some anise, chocolate milkshake, roasted coffee, and some roasted barley. Werid mixture of roasty and cloying on finish. 4.0 M: Heavier medium body. The honey definitely influenced the body, I believe. Anyway, reasonably creamy with good carbonation. 3.5 D: Definitely not a bad brew, but there's something about this that I don't care for. That said, I'm sure that most people would thoroughly enjoy this. Good overall and worth a try. The wax surprisingly easy to cut through so no worries there. Glugging from the bottle is a viscous liquid as black as night. The head is so dark, so chocolatey brown, that it nearly has a purple tinge. The foam forms easy on the pour and, even though it falls, always remains at least a solid cap on the surface. Patchy foam clicks here and there. This guy has a very unique nose. Upfront is a wildflower quality that I'm assuming is from the added honey. Blackstrap molasses and a touch of anise play second fiddle to a deep, rich, roasted graininess. Hints of dark berries show themselves as the beer warms and compliment the roast. A bit of a tea leaf quality floats through as well. Robust roast washes over the palate and remains the centerpiece of this hefty drink. Tea like herbalness pops up mid palate along with the dark berries and deep molasses qualities. The finish bursts with roasty bitterness and herbal hoppiness while the swallow leaves behind a lingering honey sweetness. The flavor profile is unique and I dig it. The body is luxurious and full but by no means sticky or sweet. Carbonation is soft which in turn makes the body feel velvety in its slow movement. The finish is dry and bitter from both the hopping and roast. This one is going down pretty quickly. Olde Hickory's Imperial Stout is big and robust. A heavy roast adds bitterness while a moderate hopping adds a touch as well. Unique qualities like florals and molasses set this beer apart from others. More of these will be in my future, no doubt. 22 ounce bottle, thick gold wax seal, 2011 imprinted in the wax. Pours a dark, dark brown, almost black. A bit of ruby red color around the edges of the glass. Nice head and decent carbonation. Excellent aroma...powerful and pungent. There are notes of honey (bottle also states this stout as being brewed with honey), milk chocolate, anise, vanilla bean, coffee, molasses, wet wood, worn leather, and graham cracker. The taste is very, very rich. Notes of dark chocolate, honeycomb, dark roasted coffee, bittersweet espresso, toffee, vanilla, raisin, and wet rolled oats. This beer is a powerhouse. Not only does it sit high in ABV, but the beer is balanced, has a superb aroma, and tastes wonderful. The beer coats the palate, allowing some of the roasted, dense flavors to linger and be savored. Overall, this is an excellent beer--one of the best I've come across in the style. It is big, bold, and balanced. Appearance: Pours out a dark body black in color with a small-sized, beige-colored head. Smell: A boldly roasty scent to lift this tired, lonely drinker's spirits with striking notes of chunked bittersweet chocolate, a double-shot of espresso, and charred grains. Slightly lesser hints of vanilla bean and dark fruits. Taste: Heavily roasty, heavily tasting of bittersweet chocolate, with a minor hint of vanilla. Like a top-notch, top-dollar mochachino or maybe fudge brownies. Roasty, earthy bitterness with a teensy bit of astringency. Some dark fruits buried within all this lavish maltiness. Late arriving molasses. Roasty, malty finish. Mouthfeel: Medium-full body. Medium carbonation. Nicely chewy mouthfeel. Drinkability: Quite good, this one. Olde Hick's Imperial Stout is a force to be reckoned with. Poured the bomber into my bruery snifter. Tan head with beautiful lacing, this is a nice looking beer. Aroma of sweet coffee and alcohol. Taste follows the nose, a little boozy but nothing crazy. Pretty sweet but not too much. This is a very tasty stout. Pretty good all around beer. Big Thanks & Maximum Respect to ASUBeer for this beauty. Pours a shiny mahogany with espresso like lacing that holds on for a few minutes. The smell gives me a coffee roast that hints of dark baker's chocolate, but also gives ocassional hints of a Baltic Porter. A bit of roasty wood barrel comes through also. Mouthfeel is nice and full, even chewy. I also love the slick, slightly oily presence that slowly finishes each sip. This is a fine stout, but I need to get this one again. I will sit on it, and give it some more time. Stretching the limits of roasted flavor in stout means that a balance has to come from somewhere. When malt has reached its limits it's time to call in the honey adjunct for charm, softness and to offset the acrid char of roast. This is what the keen brewers at Olde Hickory knows and is well exhibited in their Imperial Stout with Honey. Ominously black and gleaning with an onyx-like sheen, the beer's frothy mocha stained cap carries the scent of turkish coffee, smoldering embers, smoky chocolate and the floral finesses of winter's honey. Sweet and roasty on the early palate, the extreme taste of cocoa, coffee, walnut, burnt toast and honey allow for a taste of sweetened espresso to open the session. Roasted barley overtakes the middle palate with ease. Charred woods, burnt toast, scorched coffee, baker's chocolate, roasting walnut and herbal chicory carry the earthy, smoky and sharp flavors across a malty sweet base of black-strap molasses, toffee and sweet & savory honey. Its rich earthiness rounds off the rough edges of char and soothes the smoked flavors before trailing with coffee-like bitterness with hints of cherry and fennel looming. Lavish, full and succulent, the beer coats the mouth with booze and sweetness, along with those deeply woven roasted overtones. A long and savory linger of sweet char seems mesquite-like with the simmering warmth of alcohol seeming irish coffee in nature. The stout begs for those sweet and tangy Carolina barbecue ribs in complemnt. A: Pours a thick, black ale with transient mocha head. No light thru this puppy. Spotty lacing. Surface can retain a bit of head with agitation. S: The hops in this are actually fairly present - piney and resiny. Then theres some good fig tones as well as graham, toast, cocoa, honey, and hints of wood. Slightest pork scent at the finish (maybe hot dog smell). T: Still pretty hot, this one. Plenty of cocoa, dry bitterness, turkish coffee, and hops. The beer isn't particularly complex, but it isn't bad either. Fairly one dimensional though. The alcohol is really poorly addressed here though. The finish is fusel plus above. M: Thick, smooth and creamy. Nice, soft carbonation accentuates the beer well. Slippery finish. O: Hard to get past the heat in this beer. Likely a really great brew at the one year to 18month marks. I would drink again, but only aged, but I would not seek for procurement. 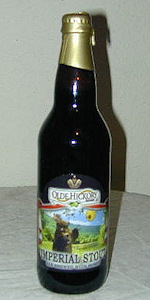 The Olde Hickory Imperial Stout is a big beer. The beer poured a pitch black with tan head which did not lace....I'm assuming because of the sweetness. The smell was honey balanced with slight roast and coffee. The taste was very sweet from the honey with some big malt, roast balance. The mouthfeel was a full body beer with smooth carbonation. Overall it is a good beer but it is not for everyone. You better like sweet big beers. Pours mahogany with a finger+ of mocha head. I had this on tap in Charlotte, served in a small (8.5oz) goblet. The beer is dark brown, close to black but not quite there. Thin mocha-colored foam that leaves dried rivulets of lace. It smells really roasty, no sweetness from the honey (at least in the aroma). The roasted malt character dominates the flavor as well, tasty but sort of lacking the sweetness I expected/hoped for. It's really rich though, lots of malt in the bill. Well-hidden alcohol, and although at first I was discouraged by the small draft size I eventually was grateful. A little goes a long way.